In 1970-71, when portable electronic calculators were first starting to enter the marketplace, Texas Instuments developed one of the first keyboards to be used with pocket calculators. The Klixon keyboard (registered trademark of TI) was perfectly designed to work with TI's integrated circuits - their main line of business. This was a time when TI had little desire to get into the actual calculator business. They were content supplying ICs, keyboards, and LED displays to other manufacturers. The TI Datamath TI-2500 was still a good year or two from the concept stage. The keyboard had the big advantage of a "click" for the user. This provided a tactile feel that was important to early calculator users. You knew "it was working." Certain collectors have descriptively termed the keyboard "clicky-sticky" due to its unique feel. The Klixon keyboard was used by Bowmar, the first US maker of pocket calculators, for their earliest models, including the 901B (above), 901D, MX55, etc, and the models they made for Craig and Commdore. It was also used by a few other early 1971-72 calculator makers, primarily (only?) those based in the USA. The full Klixon keyboard included an external (to the calculator) keypad, an internal "disc" panel, and a circuit board. The keypad itself included a stainless steel frame with "plastic" keytops. All three pieces comprised the keyboard and was termed the "6KS" assembly. The disc panel and circuit board was termed the "Basic 1KS" keyboard array. Generally the keyboard only had the four basic arithmatic functions (add, subtract, multiply, divide) and included extra keys for clearing the entry ("CE" or "C") and refreshing the display ("D"). There was also an optional "K" slide switch for a "constant" feature. Later versions included a "%" for percent calculations. We've included an ad from the December 18, 1972 issue of Electronics which shows the keyboard. In case you have trouble reading the text, we've duplicated it below. 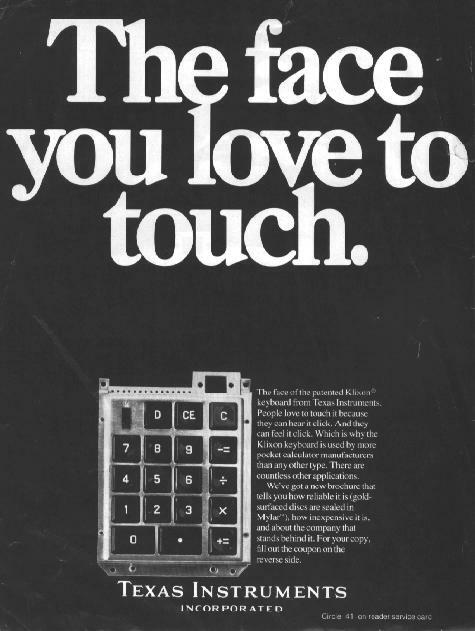 "The face you love to touch"
"The face of the patented Klixon keyboard from Texas Instruments. People love to touch it because they can hear it click. And they can feel it click. Which is why the Klixon keyboard is used by more pocket calculator manufacturers than any other type. There are countless other applications. We've got a new brochure that tells you how reliable it is (gold-surfaced discs are sealed in Mylar), how inexpensive it is, and about the company that stands behind it. For your copy, fill out the coupon on the reverse side." 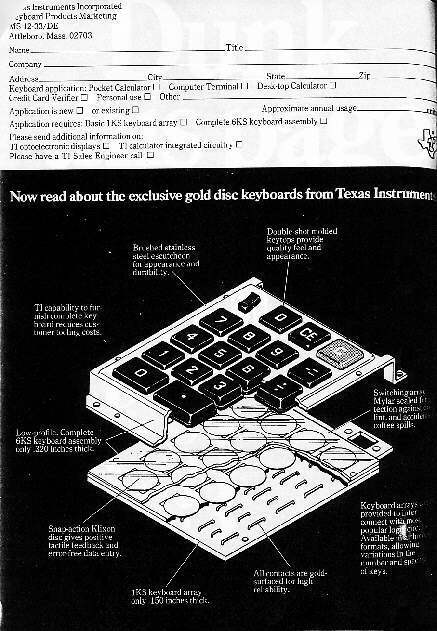 "Now read about the exclusive gold disc keyboards from Texas Instruments." "Mylar sealed for protection against dust, lint, and accidents like coffee spills." "Snap-action Klixon disc gives positive tactile feedback and error-free data entry." "All contacts are gold-surfaced for high reliability." "Keyboard arrays can be provided to interconnect with most popular logic circuits. Available in a choice of formats, allowing variations in the number and spacing of keys." "1KS keyboard array only .150 inches thick." "Double-shot molded keytops provide quality feel and appearance." "TI capacity to furnish complete keyboard - reduces customer tooling costs." "Low-profile. Complete 6KS keyboard assembly only .320 inches thick." "Brushed stainless steel escutcheon for appearance and durability." Caltronic 812, Columbia Columbia; Commodore C110, Minuteman 1, Minuteman 2; Craig 4501, 4507; Litronix Checkmate; JCE Mark II, Percent, Super D; Montgomery Ward P800.